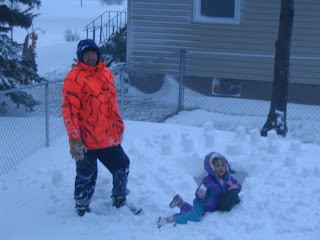 What does any sane Northwoods family do when they're in the middle of a blizzard? Bundle up the kids and go play outside of course!! We got 9" of snow yesterday and winds up to 58 mph. 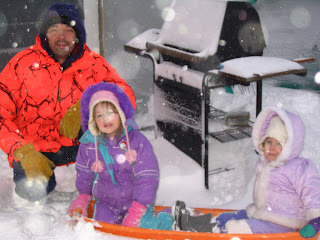 Adam had to go outside to get a jump on the shoveling and snowblowing and the girls needed to blow off a little steam. We quickly found out that the snow pants that Lily used last year are much too short for her. Her other snow pants were at Oma's so she didn't last very long. I took her in to get some wool socks and legwarmers to pull over her snowpants to keep her lower legs warm. By the time we got outside again, Adam and Addie had walked over to our elderly neighbor's house to see how they were faring. The girls went for a quick sled ride around the yard. 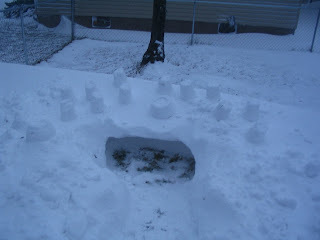 When Adam and Addie got back from visiting the neighbor's, they made a snow cave. Actually, I'm told that it is a snow "castle." They also made a little snowgirl to guard the castle. Addie had a great time playing with Daddy outside. Unfortunately the temperature has dropped to the negative numbers, so we won't be able to play outside until the weather improves. 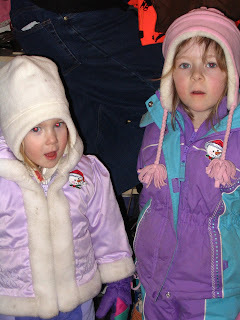 For a Packer-loving family, I'm seeing an awful lot of purple in the girls' winter coats. Hmmm... perhaps they sense the season has ended for the downtrodden cheeseheads and have switched allegiances to the surging purple vanguard.